Speaking truth about the danger Islam poses to civilized society is improper social etiquette in many parts of America these days – especially among America’s elites. Yet a few dare to do it. Understanding the Threat (UTT) certainly does. 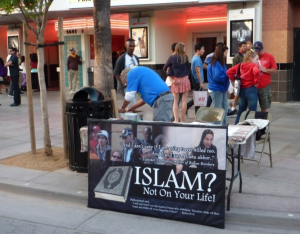 The folks at the Counter Jihad Coalition in Southern California are also unafraid to speak truth in love about Islam. They do so boldly on a regular basis. 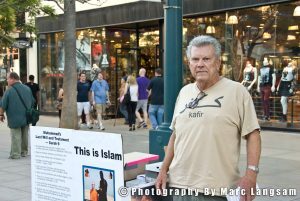 The group goes out every other Saturday to various public places in southern California including on the streets, in malls, and elsewhere to hand out pamphlets, engage people, and speak truth about Islam. Amundson says the group passes out between 1500 and 2000 pamphlets each weekend they are out. UTT’s President, John Guandolo, had the pleasure of interviewing Mr. Amundson for this week’s UTT Radio Show. The full show can be found at www.WorldviewRadio.com. Steve Amundson told UTT he does what he does out of love of liberty and a desire to see America remain for future generations. But the truth always offends those who do not have it. 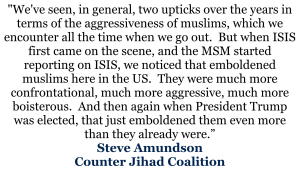 A number of people thank Amundson and the Counter Jihad Coalition for their courage and perseverance in speaking truth, but some people – muslim and non-muslim alike – are not as encouraging or receptive. What is probably shocking to many people who are unaware of Islamic beliefs is how some muslims respond. 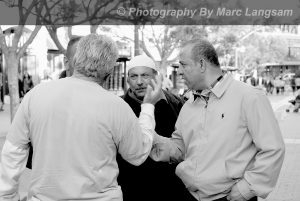 In THIS VIDEO of CJC interacting with muslims in Santa Monica, California, the muslims openly state their support for killing those who commit adultery and chopping off hands for stealing. 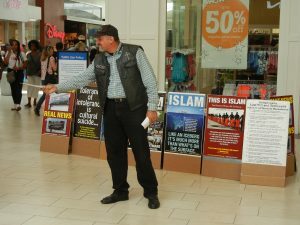 Last weekend, the Counter Jihad Coalition met with significant resistance from muslims, and Steve Amundson had to call in backup from mall officials and police. That – ladies and gentlemen – is Civilization Jihad by OUR hands. Muslims who create a public disturbance are not removed because they refuse to leave until the man saying things about Islam they do not like is removed – thus the Islamic Law of Slander is enforced in California by sworn officers of the law and mall management. That is how Civilization Jihad works. An article about this incident can be found on JihadWatch here. As a reminder to our readers: On November 4, 2010, a citizen and Marine named Randy McDaniels attended an event at the University of Central Florida hosted by the Muslim Students Association (Muslim Brotherhood) and featured speakers Jamal Badawi (Muslim Brotherhood/Hamas) and Edina Lekovic (Communications Director for the Muslim Brotherhood’s Muslim Public Affairs Council). The muscle in the room was Hamas doing business as “CAIR” (Council on American Islamic Relations). When McDaniels asked simple probing questions, he was warned to be quiet by a university official, and then dragged out of the room by several uniformed police officers. A video of the event can be seen here and UTT strongly recommends readers take the time to view it (4 minutes). An article written about the incident for Breitbart by John Guandolo can be read here. What do these two incidents, separated by 7 years, demonstrate? The lack of training for local law enforcement about the Islamic Movement in the United States, the Muslim Brotherhood’s network, and sharia leaves local officials wide open to being easily duped into taking actions that serve the objectives of our enemies, infringe on the liberties of Americans, and impose sharia inside the United States without ever having to go into a courtroom. UTT encourages citizens to get involved by getting trained – especially via UTT’s Train the Trainer program – and taking actions including those encouraged by the Counter Jihad Coalition. Boldly speak truth in love about the real threat of Islam in our society today. Thanks to the many Patriots who do so, and especially to Steve Amundson and his team at CJC (CounterJihadCoalition.org). – Then as the muslim population keeps rising, and more and more women keep wearing them, now the non-muslim women are stigmatized for not covering up. – Then non-muslim women are psychologically, culturally, and in some cases, directly pressured and coerced into covering up. – Then non-muslim women are psychologically, culturally, and in some cases, directly pressured and coerced into wearing hijabs, burqas, or some other attire that covers them almost entirely. – Finally, burqas, hijabs and modest clothing become the norm of the society, and are no longer optional. This last stage, is the final stage, which was enabled because of the first stage, of giving burqas the green signal. Folks think only of the last stage, and never take into account the entire process, with multiple stages. All this takes decades. Many, many years. It can take even up to 100 years. Since the average individual does not think that far, he or she only considers the final stage – Forcing non-muslims to wear burqas, and assumes that since this is never possible, it is completely fine to let muslim women wear burqas. And this is how we are sealing the doom for our future generations. Our posterity, our descendants tomorrow are the ones who would be paying for our tolerance of the burqas today. Non-muslim women then, would have no choice but to cover up, thanks to the women and men of today who are allowing, and even defending the muslim women’s ‘right’ to wear burqas. May the true God of the bible bless and keep you safe ,thank you for your bravery in confronting the FILTH that is islam. When 20,000 – 30,000 Muslims walk down the streets of Chicago shouting “Death to America”, the intent of Islam in America is clear, when Congress begins to write and pass the MPCA Resolution in the Senate on Islamophobia to make saying anything against Islam a felony, the intent of Islam in America is clear, when Saudi Arabia invests $150 billion to build mosques and spread Wahhabism in America, the intent of Islam in America is clear, when you can’t walk down the streets of Dearborn, Michigan carrying a Bible safely, or for that matter Shelbyville, TN, the intent of Islam in America is clear, when you can’t speak the truth about Islam to passerby’s, the intent of Islam in America is clear: ISLAM IS IN AMERICA TO DESTROY IT/KILL ALL NON-BELIEVER’S IN IT/CONTROL OR CONVERT ALL AMERICANS IN IT, TO ISLAM. Islam has infiltrated the BLM and Antifa. Who do you think teaches them about hoods/masks over face, weapons to terrorize neighborhoods, assault Trump supporters, create anarchy, indirectly, help Islam to take control faster?